Subaida, Umma and Baappa stepped into my world when I was a toddler, without even realizing that they were becoming a thread in my childhood fabric. When Subaida walked into our lives to baby sit me and later to take care of my toddler brother, she was just a teenager, staying in a small house at the end of our street. She used to call her parents Umma and Baappa (mom & dad) and I guess that’s how we all started addressing the couple in the same fashion. She was an average brown skinned girl with a beautiful smile on her face which gave a natural blush to her otherwise humble face. It was those mehendi stained hands of Subaida that sprouted my obsession for Mailanchi/Mehendi (henna). They had lots of Mailanchi plants, the leaves of which she stone grounded into a smooth paste and applied on her hands and feet; me and my cousin, G chechi used to be green eyed whenever we saw those bright reddish stains left on her palms as the paste we made never gave results close to hers. Since she knew I was crazy about applying Mailanchi on my hands, Subaida sometimes shared the freshly ground paste with me and my mother. The next day, on my way to school, as always I would catch her either washing vessels or filling pots at the road-side water-tap, wearing a full skirt and a tight blouse and ‘Thattam’, a long scarf covering her head. I was always excited to talk to her on such days to show off the artistic design my cousin or mother drew on my hands, using the paste she gave. I must admit that the modest art work on her hands still had a brighter shade than mine! The secret she shared was adding some sugared lemon juice occasionally on dried up paste! We owe it to Sulaiman, Subaida’s brother who was my mother’s 911 agent for getting her life-saver nasal drops whenever my father was at work and she wanted a refill badly. Subaida’s Baappa, Saayu as everyone called him, had a pettikkada (small shop) at the main road where we waited for our school bus. That pettikkada served as a shelter for us during the rainy days while waiting for the bus to come. On a desk supported by wooden boxes, Baappa lined soda bottles which came locked with a marble on the bottle neck; glass jars filled with Kappalandi muttai (candied groundnuts), naaranga muttai (candied lemons), lollipops and had some outdated copies of the bi-monthly publications like Mangalam, Deepika hanging from a rope along with the homemade naaranga achar (pickled lemons) sachets Umma made at home. Those kappalandi muttai and naaranga achar sachets always tempted me but it was my brother, a nursery brat at that time, broke my father’s Lakshman Rekha. One evening while walking back from the bus-stop, he devoured those candies and casually informed my father “ Acha, saayu-nte kadayil oru 50 paisa-de ‘pattu’ undu..” meaning, “Dad..I have a 50 paisa debt at Saayu’s shop”. My parents were quite alarmed and amazed at their 5 year old’s ‘cool’ behavior and mastery over the colloquial language!! Baappa earned his living mainly by selling soda sarbath (lemon soda) and Beedi to men coming to pray at the juma masjid (mosque) behind his shop. This mosque was another target of my curiosity as I saw only men coming to the mosque wearing white mundu (wrap-around) and full sleeve shirt, with a hand-kerchief tied on their head, to cover their hair. After washing their hands and feet in a small pond in the compound, I got a glimpse of them kneeling on a mat offering prayers. It was years later I realized that those men were coming for Niskaram (prayer). Baankuvili (call for prayer) was another fascinating mystery to me for a long-long time. Mosque was crowded with men especially during the festival days of Ramadan and Bakrid. Passing by Subaida's house during that festival time was like self-inflicting excruciating pain as the aromatic neichoru (ghee rice) and kozhicurry (chicken curry), which Umma cooked, made unsolicited entry into our nostrils, making our life miserable. We were on top of our excitement whenever we got an invite to attend Subaida’s sibling’s Nikah (marriage) as for us it was not only an opportunity to relish their ghee loaded fragrant Biryani but to experience the orange squash and ariyunda they served at the Mailanchi kalyanam, a function on the previous day of nikah. Grind everything to a fine powder. This yields around 2 tsp masala but you will require only 1 ½ tsp for making this dish. Wash and drain the rice on a paper towel. When it is medium dry, heat ghee in a large skillet and adds thinly sliced onions and sauté till it is transparent. Add rice and stir continuously for 2-3 minutes in low heat. Microwave Method: Transfer everything to a microwave safe bowl with 5 cups of water (2 cups of water for 1 cup basmati rice) and adjust the salt and pop it in the microwave and cook for 23-25 minutes or until rice is done. Stove-top Method: Boil water in a heavy bottom cooking vessel, and when it comes to boil, add all the ingredients and bring it to a boil again and then reduce the flame and cook covered in low-medium heat, until rice is fully done and water is absorbed. Using a fork, gently fluff/separate the rice, so as not to get sticky. Make a wet marinade with chilli powder, turmeric powder and salt and apply it on prawns and leave it for 20 minutes in room temperature. Meanwhile grind ginger, garlic and green chillies into a paste and keep aside. Heat oil in a pan and shallow fry Chemmeen/Prawn/shrimp to a light brown colour and remove. Add sliced onions to this leftover oil and sauté till light brown. To this, add the ground ginger-garlic-green chilli paste and fry for another 2 minutes. Add coriander powder, stir well and add ½ cup water and salt to taste. Let it cook till the gravy is thick and at this point add fried prawns, lemon juice, chopped coriander leaves and mint leaves and 1 ¼ tsp Biryani masala/dry spice mix. Stir well and let everything come together for a minute and remove from the fire and keep aside. The final part of the cooking can be done either in a conventional oven or on stove top. 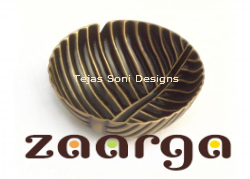 Decide on your preferred cooking method and based on that decision, choose your cooking vessel. Pour 2 tbsp ghee into your cooking vessel; spread half of the rice at the bottom, followed by the Chemmeen/Prawn masala and sprinkle ¼ tsp biryani masala; spread rest of the rice as the top layer and drizzle 2 tbsp ghee. Conventional oven Method: Preheat oven to 350 F. Close the oven –safe dish with aluminum foil and cook for 30 minutes. Stove top Method: As per the original recipe, remove half the rice ( from the vessel you cooked rice earlier) to a plate ; pour the Chemmeen/Prawn masala, sprinkle biryani masala and then transfer the rice, set aside in the plate, back to the cooking vessel. Keep a tight fitting lid and cook over very low heat for 5 more minutes. Note: I haven’t tested this method and hence I am not sure of the outcome. To Serve: After the final phase of cooking, let the dish rest undisturbed for minimum 30 minutes on your kitchen counter. 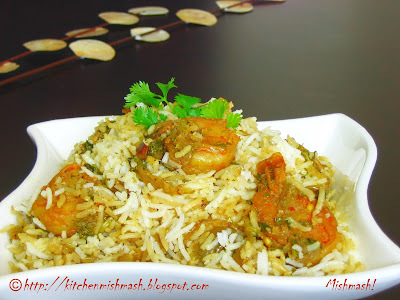 Before serving, stir the entire dish gently, mixing rice with the Chemmeen/Prawn masala and plate it. Serve with Pickle, puli inji, Pappadam and Onion-yogurt salad (Thinly sliced big red onion, 1 small green chilli chopped and mixed with yogurt and a dash of salt) or any one of these condiments. Verdict: We liked this dish and felt it is a Biryani preparation that is designed to highlight the flavour of Chemmeen/Prawns. It does not have the customary frou-frou of caramelized onions, nuts and raisins in between the layers or as garnish and yet it comes out tasty and personally I felt it was more “home-style”. Tasty and Easy to put together on a weekend ! 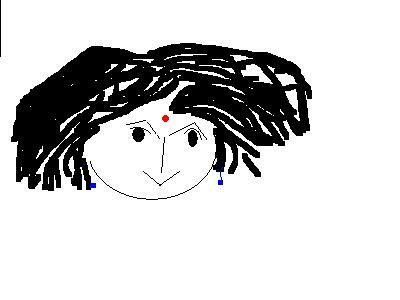 You can check out this picture of pettikkada which looks similar to that of Baappa's. Hey, first time here. I dont eat meat, but I was amazed by the detailed instructions, you have tremendous patience! Beautiful pics on your labels as well, makes me want to read each one of them. Loved the pettikada description. My favourite pettikada was one near kozhikode beach, it had those amazing "uppillitta manga". Those mango pieces were simply out of this world. Still drooling remembering them. Nobody makes them these days I guess. that looks so yummy! can't remember the last time i had biriyani. and those prawns are HUGE! ohhh gosh tht story was so real!! ur description of the pettikada rekindled the memories of those white colored gas mittai and also those naranga mittai, which even my parents never allowed me to eat..
who knows...we might be talking of the same ambols!! my ambols is now in cochin..and urs?? This made a nice read, Shn! 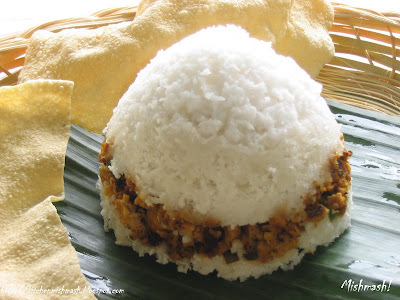 Just earlier, a Maloo friend was recommending Kerala biriyani from some restaurant and when I asked her what was special about it, she said they probably added coconut milk and that it would be white, not yellow! I've noticed there's no coconut in your recipe, the comment was just an observation. omg... omg...... i don have time to read it prplyyy but iam cming bk for more.... the pics r amaziinng... willl try this out this sunday! 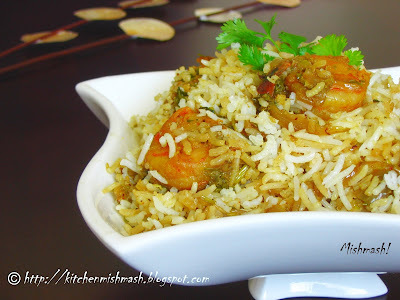 Hi Shn..another lovely post which makes a lovely read for all of us..
Prawn briyani looks delicous...you have lovely blog..first time here.. The biriyani seems to be quite diff to make, but then iam trying it. and hey i keep showing ur blog to my mom, now she loves it as well. wht a drooling and tempting pic...superb...i love ur blog aand u rock with ur recipe..keep up ur good work....loved asusual ur ecipe..i am fan of prawns..
Another beautiful narration.! !Great pictures as always..Even I got a copy of Ummi Abdulla's Malabar muslim Cookery & Epicure Cook Book.Valuables.Waiting for next on menu. Thats why I love coming to your blog, so nice and a touching story. I used to to get my hands painted with henna too, and the trick is sugared lemon juice for that dark colour touch..
Prawn Biryani is simply awesome , will try out someday .Thanks for sharing such varied cultural stories and recipes . Wow!Looks absolutely tummy! Can't wait to try this one....and your story was so interesting too...love your blog...has some great Kerala recipes. I've tried a few and followed your painstakingly detailed instructions and never gone wrong. Thank you so much! Pardon my ignorance if it sounds weird but I'm broke and inexperienced and maybe overly ambitious? Shella, I hope you re reconciling with the past and getting back to life......nice to see you here....take care ! Hello..was just surfing and found ur blog..to be honest wit u..i tried ur prawn briyani and was cooking it contionously for 3days..till my son told me to stop it.it was simply delicious..thank u so much for such lovely recipes.m making the briyani again tomorrow for my neighbour..will try other recipes too ..soon. i tried making it and WOW! it came out just perfect , enjoyed by family and friends .I am Going to Link it in my next post..
Wooooowwww...what a nice write up....Loved reading it...Normally I dont read so long written stuffs. But urs are so amazing that I read them in all post. My house back in kerala has a pettikkada just next to the main gate of the house and a mosque opposite to it.....all ur story took me there!Nice pics u got.Keep it up. I liked the pettikada and naranga muttai part. Took home a copy of this recipe for my wife to try out; hope she gets it right. Since my culinary expertise is limited to poaching eggs and microwaving stuff from the fridge; I had to google out the malayalam counterparts for the likes of fennel/cumin seed for her. Nice post. Keep penning ! Thankyou for the wonderful recipe. Made this last night and paired it with with puli inji. It was a big hit with my family and friends. 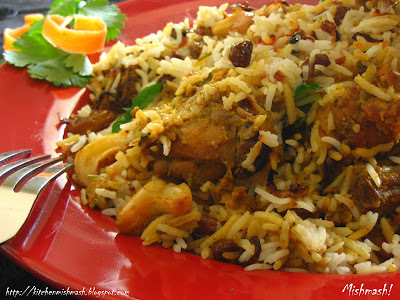 I made this biriyani today..excellent...!!!! Thanks a lotttt dear!!!! how many people does this serve? I am planning to prepare this for my son's birthday. 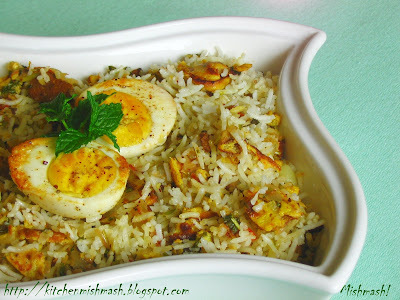 I tried ur receipe yesterday and wat to say.....as u said abt ur egg biriyani,the only word i can use is fantastic.My family liked it like anything.thank u so much for this receipe.Keep posting wonderful receipes like this. your posts are all really awesome. i turned to be a fan of yours. especially the photos makes me mad. my mouth is full of water. 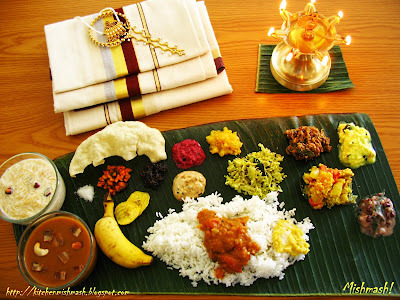 i love those traditional kerala cusine. 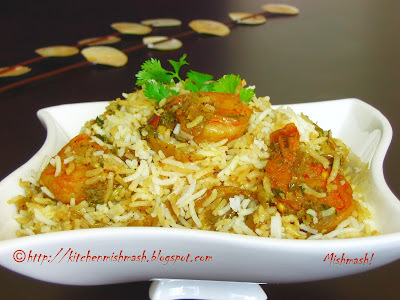 have been thinking of making prawn biriyani for few days. came to see if it is any different to what my mom prepares. It's very similar to what we prepare except for that,when we prepare ghee rice, we add cardamom,cinnamon sticks,cumin and cloves after sauteing onions. We also add curd to gravy, but thats optional:)thx for the recipe. 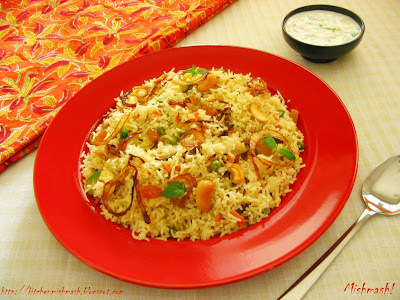 I tried this biriyani yesterday and it was mouth-watering! Trying to decide what to attempt next..
Mishmash, I tried this Biryani last weekend and it came out EXCELLENT. This is the best ever Biryani I made and tasted. Keep posting more Kerala recipes. I tried your recipe yesterday. Also the karimeen pollichathu. My husband and I loved it. Planning to make it again this week end for my parents. Keep up the good work. Paalappam – Cleopatra of Kerala Cuisine!